Home » Donkeys » How to x-ray a donkey! How to x-ray a donkey! Today ERF went high-tech as Nanette’s feet were x-rayed to assess the damage her over-grown hooves have caused. 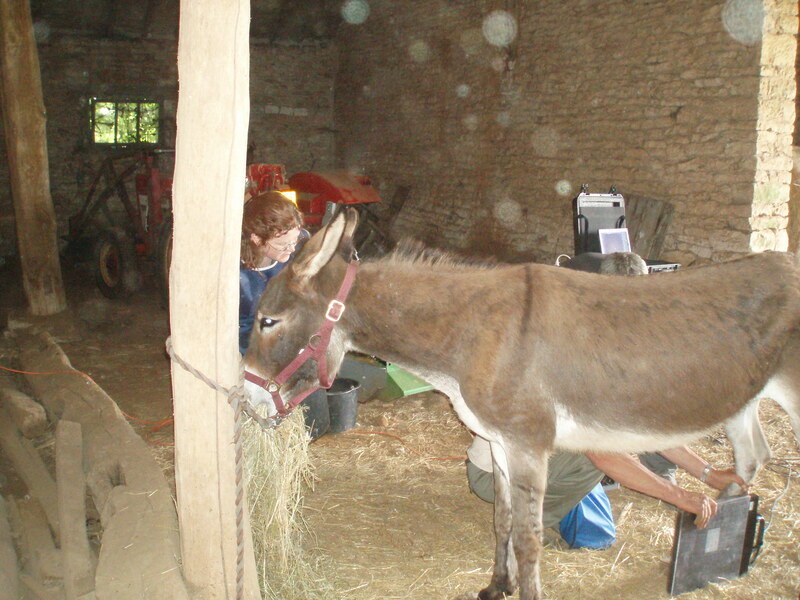 The Donkey Sanctuary have generously agreed to fund Nanette’s treatment given her background, and requested the x-rays so we can agree the farrier work required. Fortunately, our local equine vet has one of the very few portable x-ray machines in France so duly turned up today to take her pictures. Usually he works with expensive thoroughbreds at prestigious stables and studs across Europe, so instead of a pristine treatment room he was amused to be led to our earth floor barn! 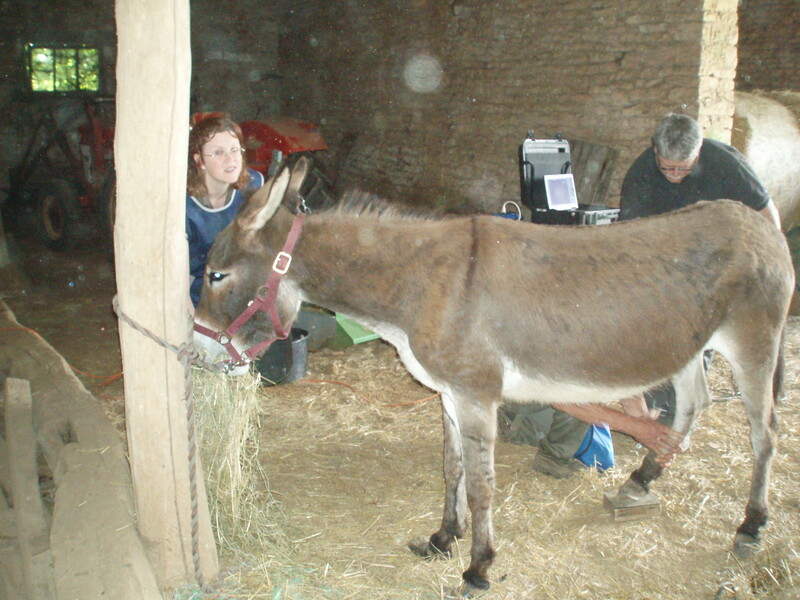 Nanette was a star and, after only a small amount of bribery, allowed us to take x-rays of all of her feet which will be e-mailed to the Donkey Sanctuary vets. Our vet pointed out deformation in one of her feet and some compression injury caused by the over-grown hooves, but overall we are hopeful that she will be able to lead a full life. After vaccinating and checking Belle and Lena, the vet met Titan who is already much calmer and more trusting. Needless to say, he is not microchipped or vaccinated so we started to put this right. We also discussed pain control as he is struggling to move and lying down for long periods – bute had given him some relief but is not recommended as an on-going treatment for donkeys. Instead we have Quadrisol to manage the pain and prepare him for the imminent visit from the farrier. Finally, we just want to say a big thank you to our husband and wife vets who are very supportive of our aims. They themselves spend a large amount of time repairing poor farrier work or helping where no farriers or equine dentists have ever visited. They have been a valuable source of information and help.